How to stop the indifference epidemic? One of the more common diseases seen on this planet, goes by the name “INDIFFERENCE”. In some parts of the world this illness has become an epidemic, and is extremely difficult to fight. Here in Costa Rica it’s really not much different, as the disease is spreading fast, and there is no vaccine to stop it once and for all. Years ago we decided to start an awareness campaign using the motto: “INDIFFERENCE KILLS – TAKING ACTION SAVES LIVES” with the objective of stopping this epidemic, and to fight its most common manifestation: “There’s nothing I can do about it”, and to stop the apathy and the “As long as it doesn’t concern me” syndrome. Did we change anything with this campaign? – I don’t know. I want to believe we did, but I am not so sure. It’s not like having a vaccine which will stop the epidemic and prevent it’s return. It’s trying to change something so deeply rooted in our daily lives that a few pictures and slogans aren’t going to change it overnight, so let’s just continue our “baby steps” and hope that one day we will see a change for the better, where we show that we can change the things that stop us from realizing our true potential. INDIFFERENCE KILLS – don’t be apathetic, don’t feel sorry – ACT! Like we’ve done during the last few years, this year we again continue bringing days of fun and educational activities to our local communities, with even fewer available resources. Reaching out to the community gives us the advantage of communication, not only with the kids, but with their brothers and sisters and often even the moms, who also enjoy coming out and watching the activities. Thank you to all of you that helped to sponsor this project, and to Angela Mariafrom MireVea Art School for the wonderful job she does. Almost 2 years ago Lucky “adopted” Mari. She followed her all the way from the beach to work, waited there patiently for 8 hours and then followed her home. There was no way Lucky would leave, so Mari and her boyfriend Paco offered to be the foster home for her. 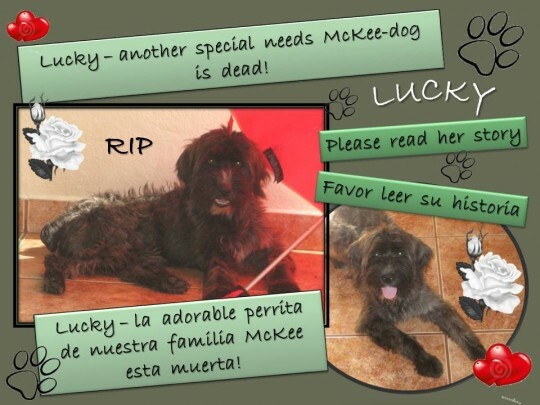 Unfortunately, Lucky had a chronic kidney insufficiency caused by a case of ehrlichiosis that was never properly treated. She was dearly loved, and even though her life wasn’t long, it sure was a very happy one. 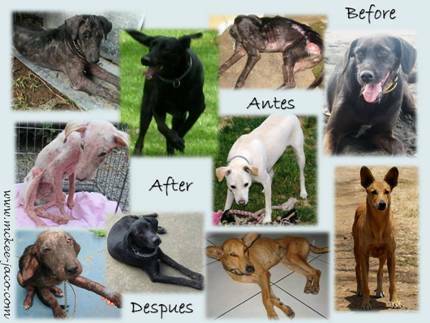 All this was possible only with the special (and very expensive) care she was receiving, thanks to many very generous sponsors. Thank you to all for helping with both her treatments and the special k/d food, as well as to Dr. Marco Rodriguez fromLaboratorio Clínico Jaco for helping us with Lucky’s blood work. 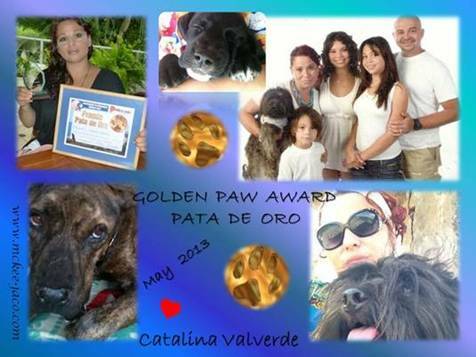 Also thanks to Veterinaria Dra Wendy Villalobos for always being there for Lucky when she needed her treatments. And thanks also to Maribel Guerra and Paco who gave her a home, and made sure that the last 19 months of her life were full of love and fun. We knew from the very beginning that Lucky’s life wouldn’t be a long one, but thanks to all the wonderful people involved in her rescue and care, her life was certainly a very happy one. We spent one entire day in Tarcoles, offering general checkups, vaccines, de-worming and de-lousing, as well as various other treatments. First, we attended to the stray animals at Patricia Holmer’s place, and then to the low-income members of the community, providing yet another example of how this community has changed in the last few years. The pet owners were very interested in learning more about proper animal care, asking how to prevent the most common diseases and how to treat their pets if they get sick. It turned out to be not just a clinic, but an educational event as well. 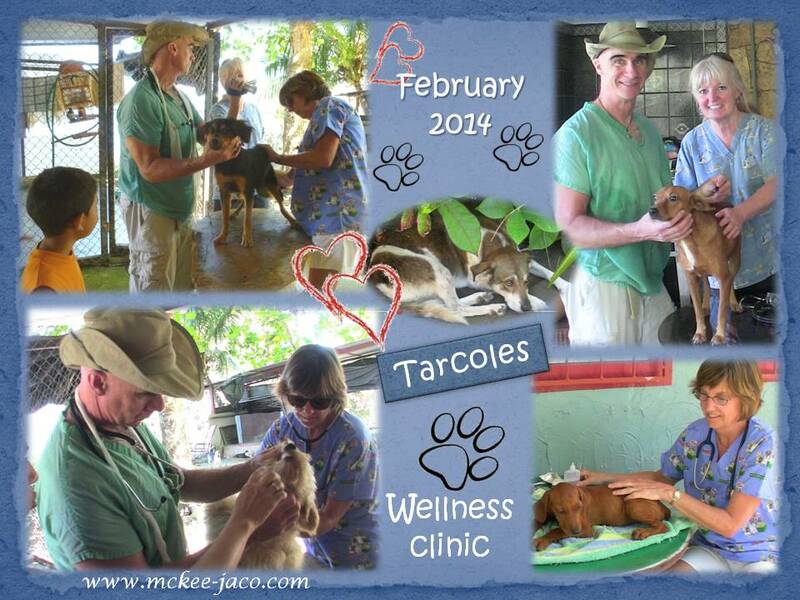 We were able to organize this wellness clinic thanks to a fabulous vet team from the States: Dr. Robin Stronk and Dr. Richard Righterwith his wife Shirley – the same team of professionals who for the last 3 years have been donating their services to us for the entire day of their vacation. 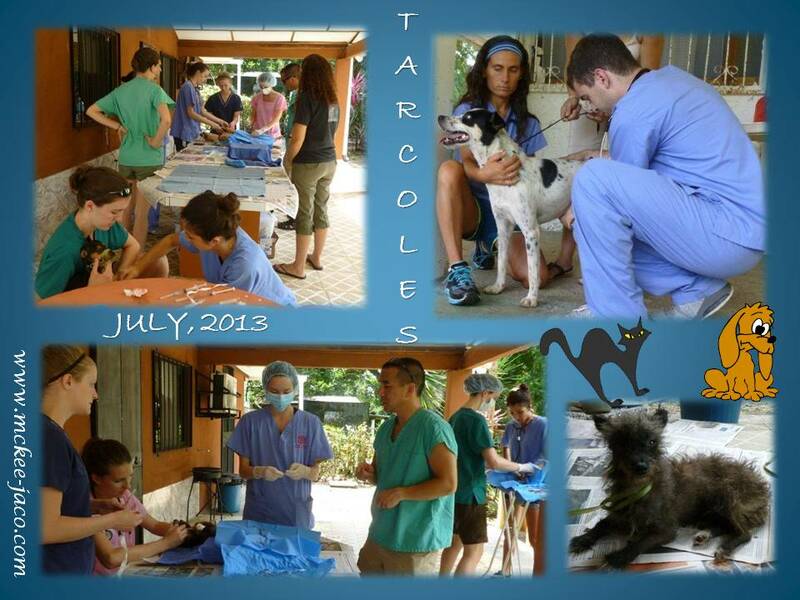 Over 50 animals were attended to during this clinic. 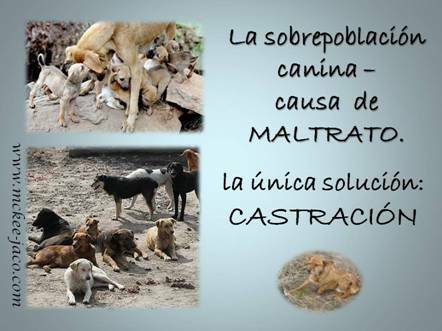 80% of them were rescued strays, with the rest belonging to extremely poor families. 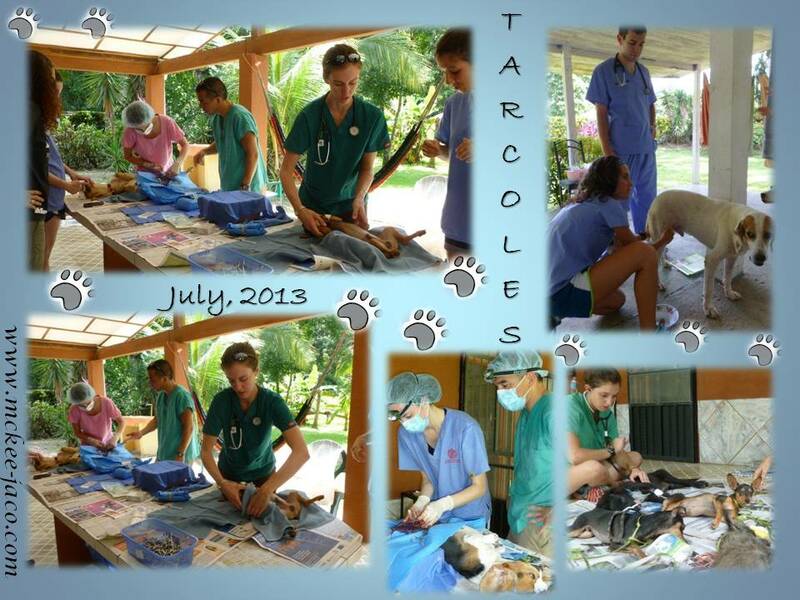 Thank you to Robin, Richard and Shirley for dedicating their time and skills to the poor community of Tarcoles. Our guests also brought all kinds of meds and supplies – antibiotics, eye/ear treatments, de-worming pills, as well as flea and ticks treatments, a part of which was used during this clinic in Tarcoles. 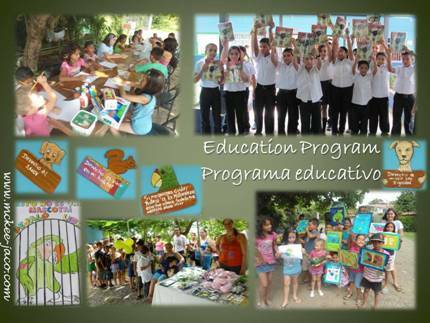 The rest was later distributed between two no-profit organizations in Costa Rica. Another big thank you goes also to Mary Kathryn Edwards, a sales representative for Merial in the U.S. who donated to this project Heartgard and Certifect, two products always needed here, and to Jennifer Beetle (also from the U.S.) for a large donation of Multi Advantage. We have been continuing our spay/neuter program with our “little spay days” at the Plaza Boulevard Clinic, so far spaying / neutering 85 animals. Thank you to Dr. Bernabé Berrocal for performing the surgeries for us, and to the Team at the Clinic Plaza Boulevard for making it possible. And also a big thank you to all of you who sponsored all these surgeries, as without your financial help this would never be possible. Because by the law all breeders in Costa Rica must now comply with legal requirements and special permits, there is a new, cruel business created by unscrupulous people, which we call “puppy hustlers”. These individuals are usually found in high traffic areas such as near a mall, or they can be found online through their website, which will contain just a few cute pictures of different breeds of puppies, along with some basic information and a phone number. Some may have a Facebook page, following of course the same basic scenario: pictures, phone numbers, yet with no vital info about the animals and/or their lineage. They offer all breeds, and often sell you a puppy which is both much too young to be weaned from the mother, as well as never de-wormed or vaccinated. They will also not supply you with any information on your pet, such as date of birth, date of all treatments received so far, the name of the mother and/or contact info of the owner. You will receive a puppy, and everything else is just hot air. When you bring your new pet home, you could find out that it’s too young to eat solid food, that it has worms and parasites, and that it hasn’t had any shots. If you are lucky, your pet survives. And don’t even consider the state of the animals parents, because you really don’t want to know! You should also know that the authorities are powerless to stop these individuals, as they are seen only as “intermediaries”, (actually just middle men) so at this time the only way to fight them is to inform the public about them and publish each case of negligence, along with names and phone numbers. The more people that expose them for what they are, the sooner this situation will be taken seriously and the sooner the authorities will implement laws prohibiting this kind of activity. As a far better alternative, shelters are full of all kinds of animals deserving a good home. If you are looking for a puppy of a particular breed and cannot find it in the shelter, please find a certified, responsible breeder. Visit his or her home or kennel to see the puppy’s parents and observe the premises – is it clean and odor-free? Are the animales clean and well fed? Are they alert and active? Also, pay attention to how the dogs and puppies interact with the breeder – neither should shy away from him or her. Puppies need ample time to mature and socialize with their mother and litter-mates, and this is why they should not be separated from the mother before a minimum of 6 weeks from birth. Also, don’t leave the premises without any and all appropriate documentation. 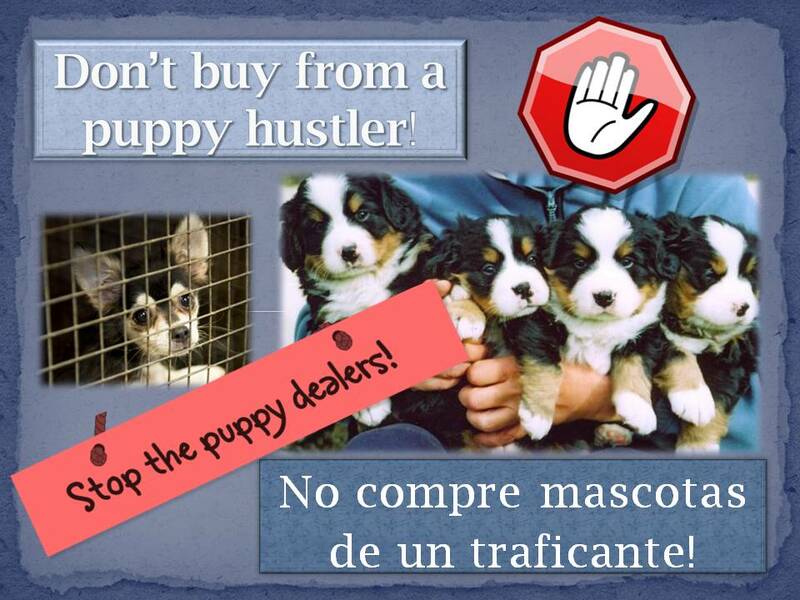 …and please NEVER, EVER buy from a puppy hustler – if we don’t support this kind of enterprise, we are just that much closer to its eradication. We started our spay/neuter program immediately after the New Year’s festivities with our “little spay days” at Plaza Boulevard Clinic. To date (January 17) we’ve been able to spay/neuter 23 animals, all strays or from low income families. Thank you to Dr. Bernabé Berrocal for performing the surgeries for us, and to the Team at the Clinic Plaza Boulevard for making it possible. Our goal for the year 2014 is to average 40-60 spayed/neutered animals per month – but this depends of course of the funds available. Sponsors are needed for the vacation activity “BRINGING EDUCATION TO OUR COMMUNITY”. 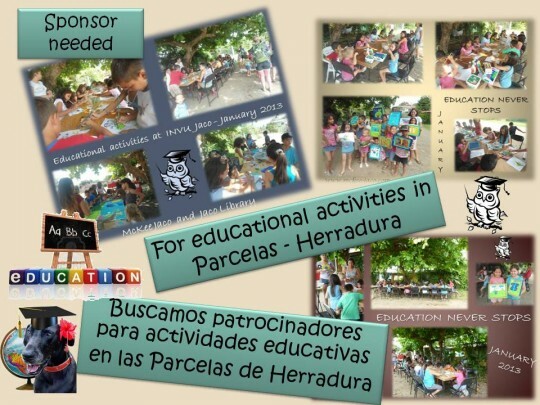 As we did last year in the INVU in Jaco, we would like to repeat these educational events held in the center of the community in Herradura’s Parcelas, in order to make it easy for the kids to reach us independently. We already got donations from Rossy Quesada at Cafe del Mar, Liz Bar from Taco Bar Jaco, Chris Karrer from Herradura Divers and Taffy Tucker – now we still need $300 in order to start this project next week. If you would like to help us, please let us know – every bit helps! 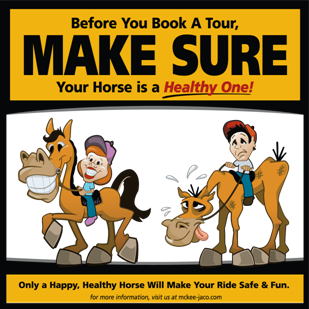 Please, before you buy a tour, make sure that your horse looks to be in good health, (LIFT UP THE BACK OF THE BLANKET TO SEE THAT THE BONES ARE WELL COVERED AND THAT THERE ARE NO WOUNDS) and make sure your horse is alert and not exhausted. 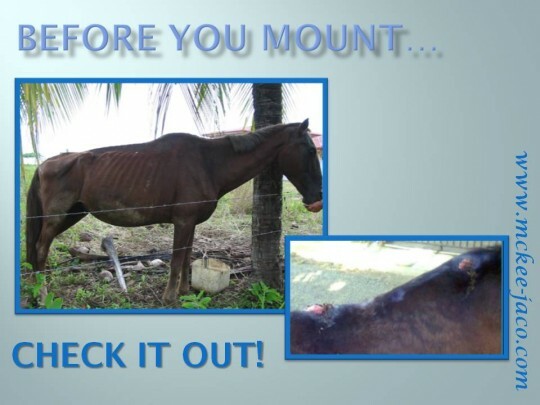 And make sure that you book the tour ONLY through a company that has a special permit to run their business, (remember no permit, no insurance) which includes THE HEALTH CERTIFICATE FOR THE HORSES – IN DOING SO, YOU WILL HAVE DONE YOUR PART TO HELP PUT AN END TO ANIMAL ABUSE. 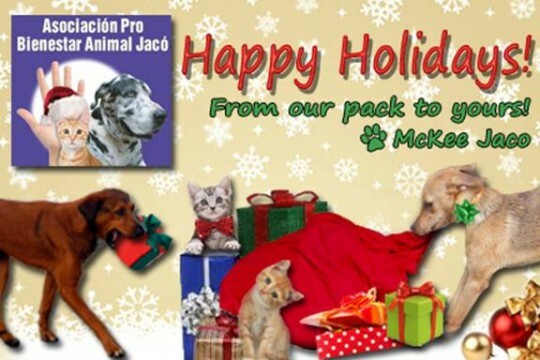 MCKEE JACO thanks all our supporters, our vets, our members and volunteers and all those animal lovers who were helping us to improve the destiny of so many dogs, cats, wildlife and farm-animals! How can we deal with the overpopulation problem? If they happen to have a female cat or female dog which is in heat or pregnant, ask them to PLEASE DON’T DUMP THE POOR THING OFF SOMEWHERE FAR AWAY FROM WHERE THEY LIVE, HOPING THAT SHE WILL NOT FIND HER WAY BACK HOME. If she is in heat, or just days after, we still can have her fixed. If she is pregnant, ask this person to please allow her have her babies in their place, and to contact us in order to help to take care of the puppies/kittens. Once they are ready to go, we will help to find new homes for them. We will also make sure that their female cat or dog gets spayed as soon as the babies are adopted. We will offer them a special low price for the surgery, and if they need more financial assistance, we will provide it for them. We will also offer the special low spay/neuter price for all babies. Please help us to resolve the overpopulation problem in this humane way. Ask people you know to be a part of the solution, and not part of the problem. The most important part of our project has always been, and continues to be, spaying and neutering. As most of you are aware, McKee Jaco has been organizing special spay and neuter events for low income pet owner throughout the region for years. We’re very pleased to inform you that, from now on, we’ll no longer need to rely on kind people offering us their private homes to set up our “mobile clinic” in Jaco area. From now on, all animals in need of fixing can be brought to the Plaza Boulevard Clinic in Jaco . How does it work? Contact us via info@mckee-jaco.com or https://www.facebook.com/#!/mckee.jaco if you wish to make an appointment and we’ll inform the clinic accordingly. We’ll confirm the fee, which will be based on your current financial situation, to you beforehand. Thank you, Dr. Bernabé Berrocal from Plaza Boulevard Clinic, for being such an important part of our project and for making our lives much easier. We’ll continue to provide our mobile spay and neuter service at reduced fees to residents in remote areas who have no way of transporting their pets or paying for a veterinarian visit. Our gratitude goes out to Dr. Jose Manuel Jimenez, who helps us with the clinics in different areas such as Esterillos, Bijagual and Tarcoles. As a result, we’ll be able to treat around 50 animals per month! 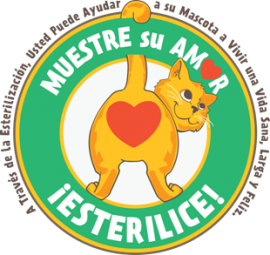 SPAYING AND NEUTERING IS THE ONLY PERMANENT, 100-PERCENT EFFECTIVE METHOD OF BIRTH CONTROL FOR DOGS AND CATS. THESE ROUTINE SURGERIES CAN PREVENT THOUSANDS OF UNWANTED ANIMALS FROM BEING BORN and the recovery time is only two to three days. Whether we own a pet or not, all of us are affected by animal overpopulation one way or another and we all carry the responsibility to do something about it! We need YOUR help to accomplish our goal and work toward ending animal overpopulation in our community. Please view our special section on http://mckee-jaco.com/how-to-help/ to find out how you can chip in. In the meantime, follow us on Facebook: www.facebook.com/mckee.jaco . Business may be slow for many of you during the rainy season, but our furry friends are in as much need as ever! DUKE – ONE OF OUR SPECIAL NEEDS DOGS – IS DEAD! 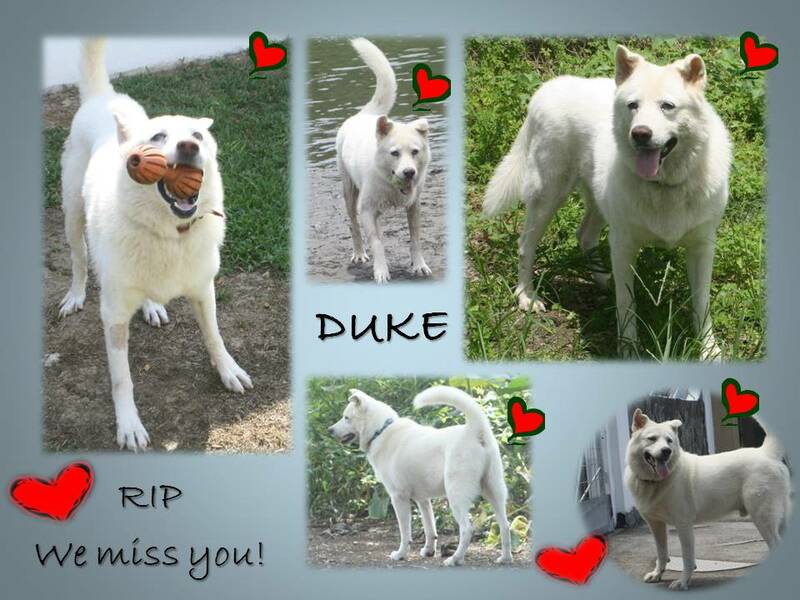 DUKE – one of our own McKee “special needs” pets has passed. The terminal disease he suffered from finally took his life, but thanks to his generous sponsors we were able to make his last 18 months quite possibly the best ones of his life, and he probably even didn’t know just how sick he really was. Thank you to all for helping with both his treatments and the special k/d food as well as to DR. MARCO RODRIGUEZ fromLABORATORIO CLINICO JACO for helping us with Duke’s blood work, and to DRA. WENDY VILLALOBOS and DR. BERNABE BERROCAL for being there for Duke when he needed permanent care. But most of all to DORIS SCHULCKEBIER who took him in and made sure that these last 18 months of his life were the best he ever had. She not only gave him a home and care, she gave him both love and respect, suffering with him when he didn’t feel good and she never gave up on him, doing everything possible to make his life as long and as comfortable as possible – without her efforts, Duke would never have had a chance for happiness. 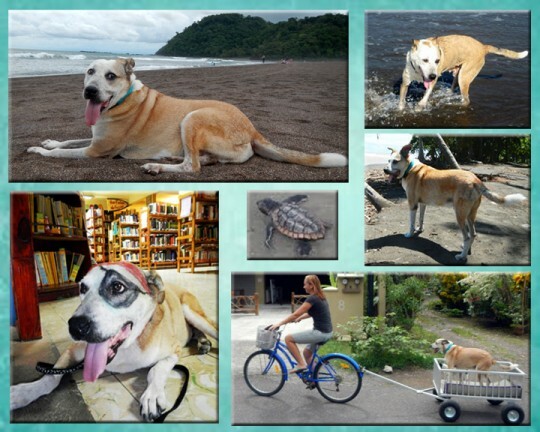 BUDDY, THE FAMOUS DOG FROM THE TURTLE FARM, IS GONE! Not even a month after we lost our beloved Duke, another tragedy happened: we lost Buddy/Pinto, the famous dog from the Turtle Refuge in Hermosa. In August 2012, he became a McKee pet because of his miraculous ability to survive the terrible condition we found him in. He had many friends and sponsors, thanks to whom we were able to provide all his necessary treatments including the famous and expensive miracle medicine Legend. Legend made him not only walk again, but also run and play with his other dog friends. He spent the last year of his long life with Liana, who became not only his foster mum, but also, and first of all, his real, loving family. Buddy went with Liana almost everywhere–the mornings were spent on the beach wandering at his leisure and watching Liana surf, and the afternoons were spent ‘working’ at the library playing with kids and teaching them how to respect a senior dog. Buddy loved his new life with Liana, and he was the happiest dog one could have imagined. Nobody expected that his body would give up so suddenly. His passing was unexpected, and we all, but especially Liana, suffer from his unexpected passing and we all miss him terribly. Thank you Liana for giving him 13 months of a wonderful life, full of love, care, and respect. And thank you to all his sponsors for being so generous in providing funds for his special needs. 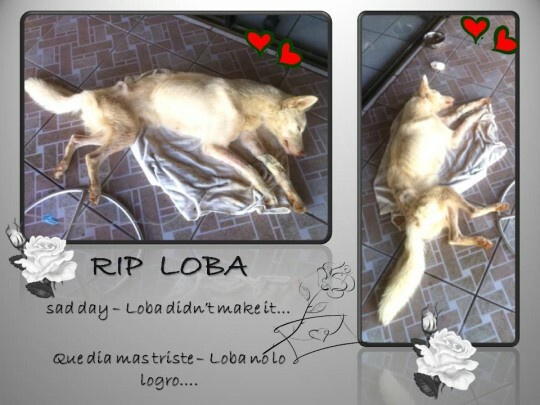 Loba was dying. Left alone in a corner of a garden, while a cold rain swept through our little neighborhood, and no one was there to help her. The man who claimed to be her owner left her all by herself on an empty property, knowing that she is sick and needs her treatment always on time. We gave him everything he needed for her, and made sure that he had all the local vet phone numbers in case of an emergency – he knew that he could bring her to the vet at any time and put it on our bill, yet apparently this just wasn’t enough to motivate him. He left her all by herself, sick and weak, unable to walk, not even able to move her head. Thanks to a few people who saw her from the street and couldn’t just pass without helping her, she ended up at the clinic. Miraculously she survived, and fought for her life for 6 more days. We were all hoping for a miracle, but unfortunately Loba lost the fight. Thank you to Dr. Bernabé Berrocal for the medical care and to Madzia Kasprzyk for helping us with her bills. As for today we still need $94. If you would like to help us with this last bill, please let us know. MANY THANKS to ALL OF YOU out there in the world that care! The 4 days we spent in Tarcoles offering spay/neuter, general checkups and vaccines to the low-income members of the community, was a perfect example of HOW THIS COMMUNITY HAS CHANGED IN THE LAST FEW YEARS. The pet owners who brought their pets in were very interested in learning more about better animal care, asking how to prevent the most common diseases and how to treat their pets if they get sick. It turned out to be not just a clinic, but an educational event as well. Never before had we seen so many well – maintained pets, and so many responsible owners considerate of not only the health of their pets, but also wanting to have them spayed/neutered, in order to help to fight the overpopulation of dogs and cats. There were many male dogs and male cats waiting to be neutered, which in anyone’s estimation is a great sign in communities down here, as before we were lucky to see a few females brought in for spaying. These clinics were organized by combining the Plaza Boulevard Clinic together with afabulous team of 2 vets and 7 students from CORNELL UNIVERSITY in New York. Our U.S. guests donated to the community of Tarcoles not only their time, they also supplied free of charge all supplies and materials needed during the clinics, as well as meds such as antibiotics, pain meds and a host of other items. 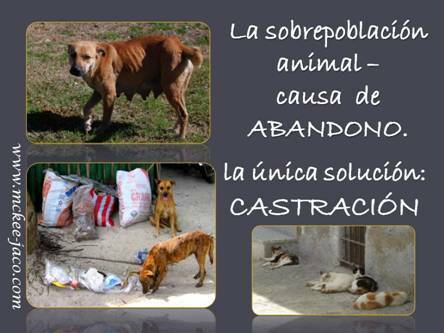 42 ANIMALS, ALL STRAYS AND ANIMALS BELONGING TO EXTREMELY POOR FAMILIES WERE SPAYED/NEUTERED during these 4 days. Another 40 WERE ATTENDED TO FOR THE GENERAL CHECK UP, SOME OF THEM RECEIVING TREATMENT, OTHERS ALL THE NECESSARY VACCINES. The teams were working 8 hours every day, first “adapting” the patios of a private house into a provisional clinic, and then proceeding with the treatments and surgeries in these most difficult conditions. Thank you to Dr. Bernabé Berrocal from Veterinaria Plaza Boulevard, to Dr. Paul Maza and Dr. Jaime Venezia from CORNELL UNIVERSITY in NEW YORK, as well as Amari Suskin Sperry, Sarah Wengert, Nadine Cross, Allison Cowan, Kate Bibi, Nicole Gianfrancesco and Andrew Massaro – all vet students of the same University. A special thanks goes also to Patri Holmer for organizing the patients for these 4 days, and for providing a place to stay for all our guests totally free of charge. This beautiful home had enough space to be used as a clinic as well, which made the organization just that much easier. Thanks also to Maria Lizano Rosales for preparing a delicious meal for all volunteers on Wednesday and to her 12 years old son Nigel Castillo Lizano for helping to take care of the animals before and after the surgery. And to Leo Hogan,Sylvia van Baekel and Doris Schluckebier for helping out wherever they were needed. 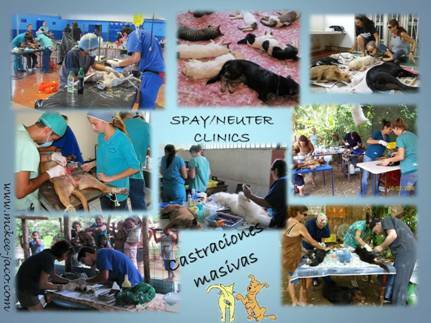 Together with the mini spay-days held in both clinics, we were able to spay/neuter 78 animals during the month of July, and of course thank you to all vets and sponsors for their cooperation. 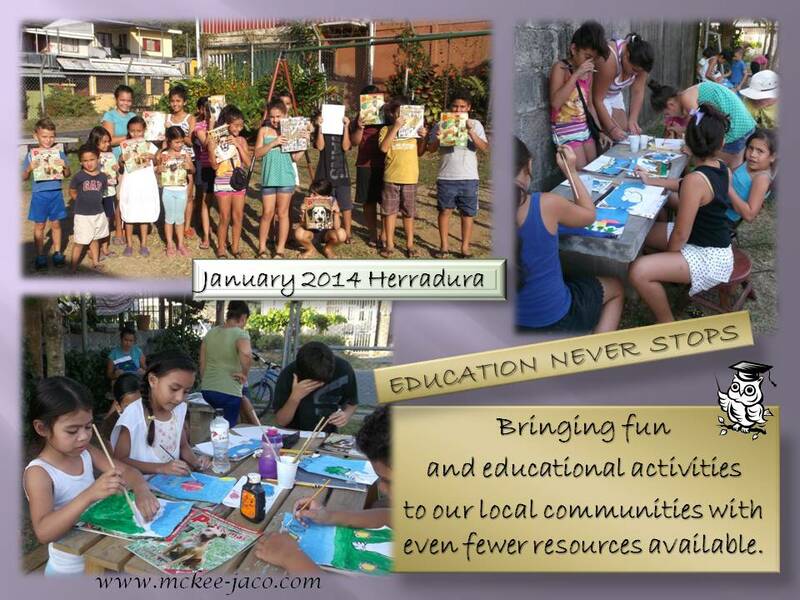 Another successful educational activity by MCKEE JACO and The Art School MIREVEA was running from July 1 to July 12 in the Mirevea facilities in Jaco, Pueblo Nuevo. It’s a part of our education program titled “SHARING THE WORLD WITH THE ANIMALS” that was developed in 2009 by CYNTHIA LIZANO, later improved byANGELA MARIA LOZANO. Our primary target is educating the younger members of our community towards a better understanding of the needs of all animals, as well as the relationship between animals and people, and how we both interact with and relate to our environment. During these 2 weeks the kids were working on a large (1 meter high) sculpture of a parrot, which acts as a symbol all wild life animals which are so often captured, only to end up living a miserable life in captivity in Costa Rican homes. This sculpture will be donated to the Jaco main school ESCUELA CENTRAL. The message of this so very important activity is: EVEN IF YOUR BIRD WAS BORN IN CAPTIVITY, AND PURCHASED LEGALLY AT A BREEDER, THIS STILL DOESN’T MAKE IT A PET. Thank you to ZORAN and MIMI ARANDJELOVIC for sponsoring the materials for this great activity. RON’S STORY is sad but with happy ending. He was hit by a car on May 5th. Even though he’s a stray, and his injuries were quite serious, we wanted to give him a decent chance for a better life, which is what we always do in cases like this. Unfortunately his recuperation has been really slow, and we actually had to have one of his front legs amputated, which is really a shame, as his back legs were affected by the impact as well. Today, almost 3 months later, he can move a bit better, and he is showing decent progress daily, and will soon be able to walk and even run straight, though maybe a little unsteady and shaky in the beginning, but who wouldn’t be after such a traumatic event? The other tragedy about Ron is that due to the accident and the painful treatments he’s become even more timid and skittish than he was before. He is distrustful of humans but great with other dogs. Desperately we were looking for a secure place to stay for Ron and it looked like it will be one of those difficult cases with no solution. An then I received a call from my friendMarina, who together with her husband Dwight decided to adopt Ron and give him a chance for a new, better life. Thank you guys for being his angels – AFTER WHAT HE WENT THROUGH, WE FEEL THAT HE REALLY DESERVES THE BEST. 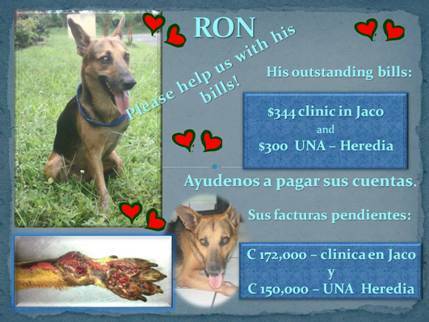 Now we need to deal with his outstanding bills – as for today it’s $344 to pay in Jaco and $300 to pay at UNA in Heredia. TacoBar in Jaco offered to cover the UNA bill, and Angela Felzmann contributed to the other one, so there will be now the amount of $324 still outstanding. Thank you guys so much for helping us with this! If you would like to help as well, please let us know. 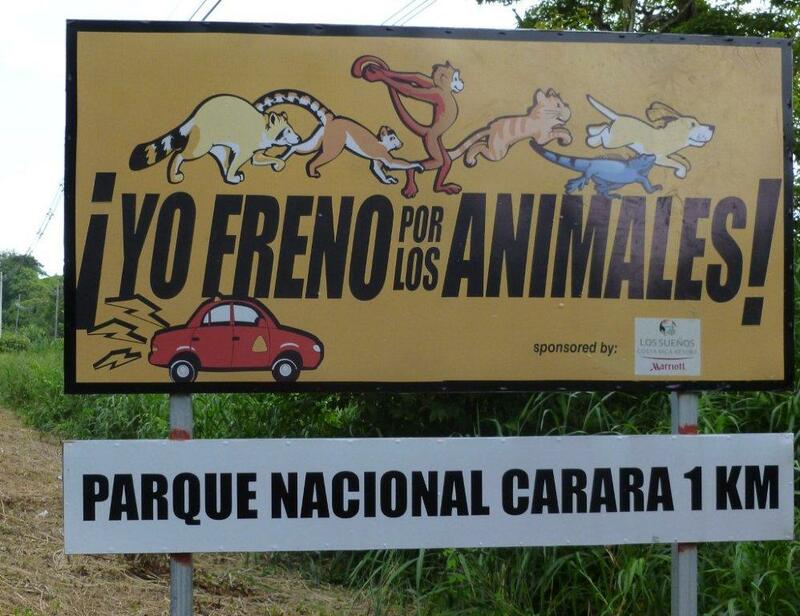 Huge Thank you to Los Suenos Marriott and Casinos Fiesta for sponsoring the signs around Carara National Park! SPONSORING A “I BRAKE FOR ANIMALS” SIGN YOU WILL HELP TO REDUCE THE NUMBER OF ANIMALS INJURED AND KILLED ON OUR ROADS! These pictures were taken by Roberto ON ONE DAY between the entrance to Refugio Punta Mala and Esterillos Oeste. 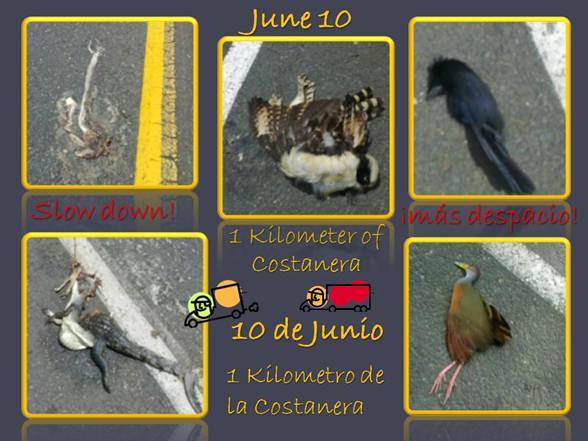 IT’S JUST ONE KILOMETER OF THE COSTANERA HIGHWAY! Please drive carefully and heat brakes if you see an animal on the road! We need more signs “I brake for animals” – if you would like to sponsor one, please let us know. 10 YEARS of dedicated service to the community and all animals in need! We’re very proud and happy to announce this milestone to you, which we would not have been able to reach without your incredible support. At this point we would like also to thank our friend Alberto Zevallos (Tito) for not only programming and hosting our website, but also for taking care of all updates and changes totally free of charge. Since 2003, McKee Jaco has been dedicated to significantly improve animal welfare through effective public awareness campaigns, education in animal welfare, animal population control and medical aid. Our mission “To End Pain and Suffering of All Companion Animals in our county” still stands strong!Despite the challenges and difficulties we’ve faced over the past decade, our determination to improve the lives of animals has always prevailed. Looking back on all these years, it’s amazing to see what we’ve managed to accomplish with such a small amount of members and volunteers. The past few years, we’ve managed to keep the organization afloat with only five volunteers:Doris Schluckebier, Arusha Pabisch, Leo Hogan, Silvina Goren and Katja Bader. We’re urgently looking for more! So much has happened, that a book or even a trilogy could be written about it! We’ve recapped the most important developments that we’d like to share with you below. The results of McKee Jaco’s steadfast efforts are astounding indeed: Over a 1000 animals are successfully treated every year! Dr. Yayo Vicente, Dr. Blas Rivas, Dr. Bitter, Dr. Carlos Morales, Vet team @ UNA in Heredia, Dr. Sergio Brenes, Dr. Rosalinda Alvarez, Dr. Shirley Hernandez, Dr. Roger Alfaro, Dr. Victor Quesada, Dr. Carolina Rodriguez, Dr. Gini Bermudez, Dr. Becky Mora Rojas, Dr. Esteban Soto, Dr. Jose Manuel Jimenez, Dr. Wendy Villalobos, Dr. Yessenia Alpizar, Dr. Federico Chaverri Suarez, Dr. Yeimi Nunez Herrera and Dr. Bernabe Berrocal all from Costa Rica, and Dr. Sean Beck, Dr. Robin Stronk, Dr. Richard Righter, Dr. Lee Wilson, Dr. Ellen Gray and Dr. Kyle Farrellfrom the USA and to Marco Rodriguez from Laboratorio Jaco! Without the help of McKee Jaco’s long-time friend and supporter Linda Look, who is also sponsoring our ‘I brake for Animals’ project, we would not have been able to launch the program all these years ago and turn it into such a huge success. 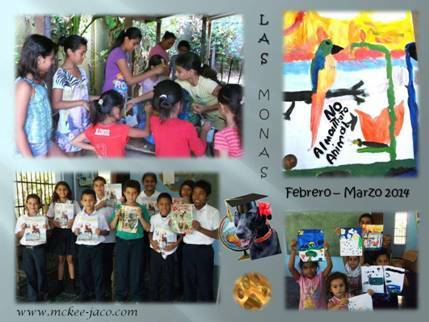 Besides the activities at schools, McKee Jaco also organizes events for children and their families within the community filled with quality animal information and lots of fun stuff to do. By bringing animal welfare awareness programs into the homes of Costa Ricans and making everyone feel included in the program, McKee Jaco strives to have its mission better understood and adopted. Education is a key element in helping pet owners become more aware and ensuring that animals receive the respect they so need and deserve. Unfortunately, as a result of the lack of available funds, the education program has currently been put on hold until further notice. Therefore, should you wish to donate to this fantastic program, or know of any funding opportunities that could help keep it alive, please don’t hesitate to contact us. McKee Jaco realized that besides medical care, public consciousness needed to be raised in order to reduce the number of injured or killed animals in traffic. An estimated 70% of all animal accidents could be prevented, if only the drivers would use their brakes. 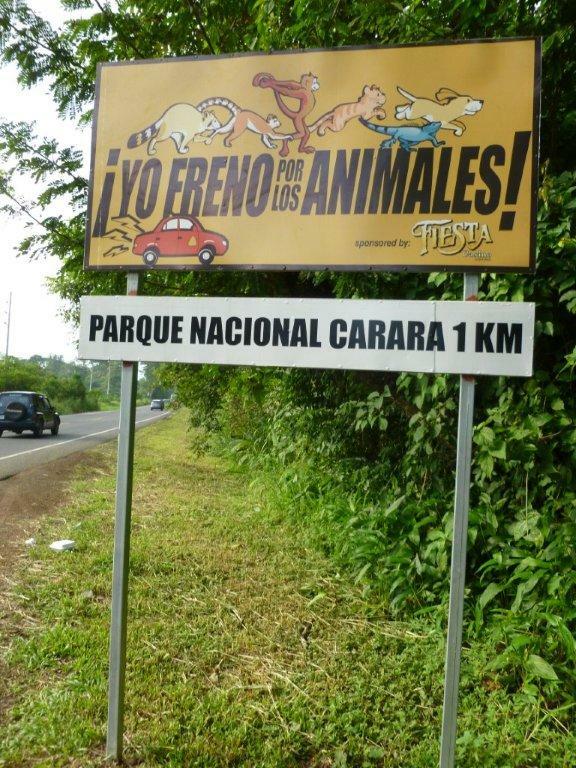 “I brake for Animals” was launched at the end of 2012 and is turning out to be a big success. Besides having already sold a great deal of bumper stickers with the mission stated on them, McKee Jaco has managed to receive the kind cooperation of a substantial number of taxi drivers. In return, they received a special starter’s kit with printed t-shirts and business cards AND the highly acclaimed status of “pet-friendly taxi driver” on McKee Jaco’s recommended taxi drivers list. Last but not least, McKee Jaco managed to have 12 road signs placed in Jaco and Herradura, which is a remarkable achievement on its own. Bigger road signs of at least 2 meters high and 1 meter wide are currently in the making and we need sponsors for these. If you wish to support this wonderful cause, or wish to connect your business with this it, please contact McKee Jaco for more information. McKee Jaco has always gone out of its way to find safe havens for animals in need and has never considered any animal ‘unadoptable’. There are manywonderful stories to prove it! “It’s been very difficult to maintain this project as we don’t have any animal shelter facilities at our disposal,” Katja says. “We don’t want to give up though, and hope that more and more people will recognize the urgency and realize that we are all responsible for the well-being of our furry friends in need. With the help of our supporters we’ve managed to find homes for over 500 stray animals each year. Furthermore, we’ve set up a special foster home program, enabling animal lovers who can’t take in animals themselves to support this program”. 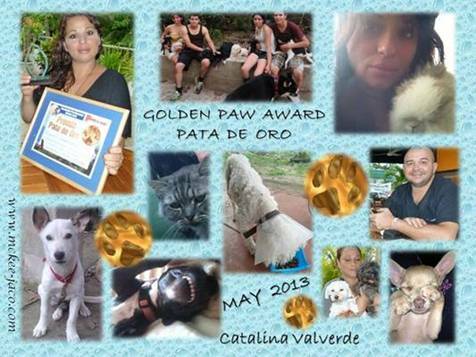 A great method of continuing the momentum and providing people a sense of involvement is through the GOLDEN PAW AWARD, which is awarded twice a year in cooperation with the magazine “Pets y Mas” to honor the people in the community for their compassion and service toward animals. 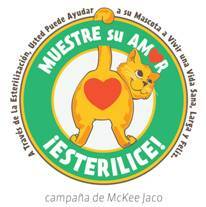 For more information regarding our other activities and wonderful campaigns such as “No a mascotización de vida Silvestre” and ’‘Indiferencia mata – actuar salva vidas”, please visit www.mckee-jaco.com or look us up on Facebook. As most of you are aware, McKee Jaco is a non-profit organisation with the welfare of animals as its main reason for existence. All our funding comes from public donations and, therefore, we heavily rely on the kind efforts of our volunteers and donors. There’s lots of work to be done in order to keep this wonderful project running and we are in urgent need of your help! Please contact us at info@mckee-jaco.com to find out how you can get involved in our wonderful cause! MANY THANKS again to ALL OF YOU out there in the world that care!